North Texas Malibu Boats dealer, Waterski America, enters the wakesurfing event and competition scene with the introduction of its Experience the Wave 1 day event on Lake Lewisville. “Come surf with us” showcasing the all the new Malibu and Axis Boats, a day of surfing for customers, new surfers and more. August 27th, Waterski America becomes the headlining sponsor of the 7th annual DFW Surf Open- Surf the Lake. One of Texas Best Kept Secret’s is Dallas, North Texan local, Parker Payne who, as an athlete entering his third season on tour, has progressed faster than any new talent since Keenan Flegel. Amateur World Champ, #2 National Champ, third in “Surf” and top six in “Skim” at this passed weekend’s first ever Pro Wake Tour that has combined wakeboarding and wakesurfing for the first time since the start of the Pro Tour nearly a decade ago. The first of its kind, World Championship format, where ladies take center stage above the guys- surfing last and awarded last. At the legendary Ski Shores LATX featuring some wake surf pioneers like Bubba Gainan and Jack Oman as the head judges and then the top athletes in the game right now, all Texan locals, including Ashley Kidd (left), Raleigh Hager (middle) and Morgan Lohmeier. DFW Surf’s annual Big Boat Invitational gets a little bit bigger and a world record number of wakesurfers on one wave including Dominic Lagace, Ashley Kidd, Parker Payne, Todd Johnson, Brandon Tollie, Danny Braught and Tyler Marshall. 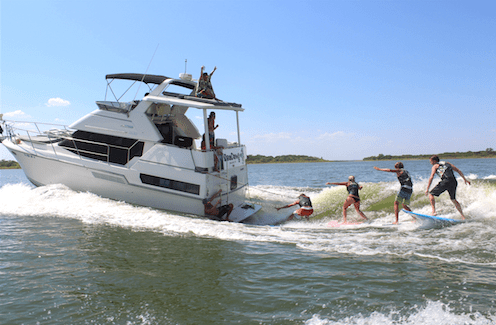 Texas based boat company, Tige Boats, kicks off the second wake surfing tour with the Endless Wave Tour and two stops in Texas including Wake the Desert, the longest running wake event, and the Texas Surf Showdown at Marine Creek in Fort Worth. 2015 will be a big year for the Fort Worth stop, which will now be called the US Open of Wake Surfing and will feature a weekend full of festivities. 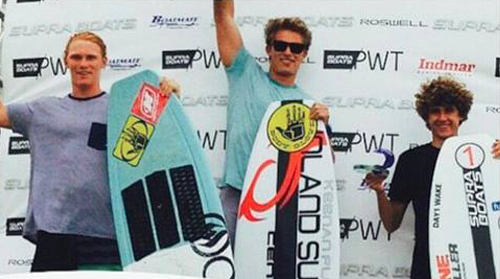 Austin local Raleigh Hager becomes the youngest champ in wakesurfing history. Then a year later she does it again on Lake Las Vegas. Today you can find her wakesurfing on Lake Austin with her new Mastercraft X-23. Check out her latest video in Boarders Magazine. One of Austin’s longest running and favorite grassroots surfing event at Steiner Ranch Pavilion. 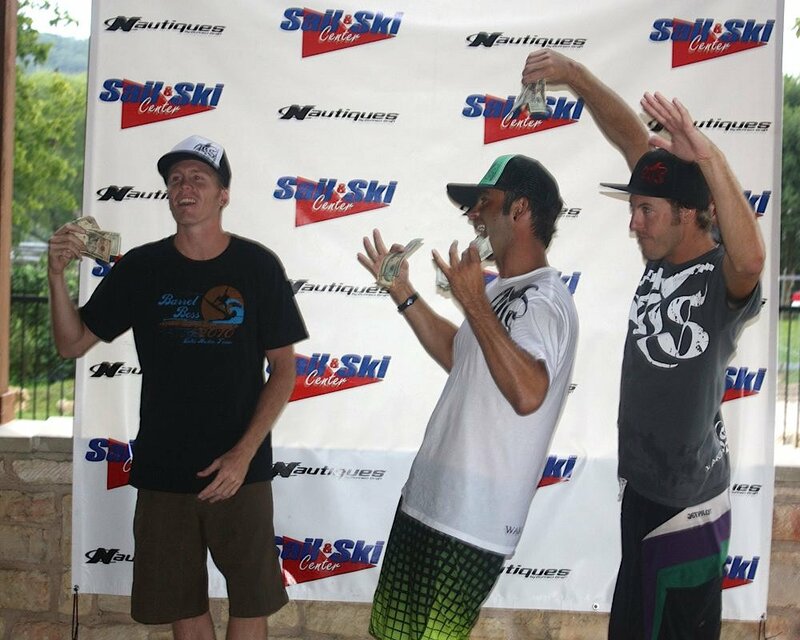 From left to right: Tyler Marshall, Sean Cummings and Wes Beck celebrating the Barrel Bosses second year as both a grassroots amateur and professional contest with cash prizes. The Texas Wake Surf State Championships featured a star-studded cast of pro wakesurfing talent. This was a tough year for the boating industry because of the economic recession. Although there was no official World Wake Surfing Championship that year, there was a big party down in Texas thanks to Todd Gaughan and Ken Willingham of the Houston based wake surf retailer- The Wake Outlaws. 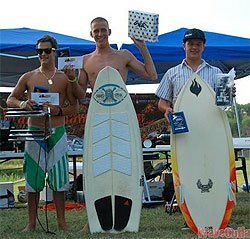 Pictured left is Chase Hazen, James Walker and local Texan Jack Oman who took second in men’s surf. Historically, this was the first time that surf and skim style were separated in any event. Land Locked Surf Fest marks the first produced wake surf contest in Texas thanks to the efforts of Tyler Marshall, Austin Surf Company, Wake Outlaws, Fresh Air Exhaust and Texas Mastercraft. The X-45 was the official towboat and Centurion Boat’s Todd Gaughan takes first place with a 360. Todd, pictured left, rocking his Walker Project surf style 4’10. Starting back in 2007, DFW Surf founder and inland surf pioneer, Tyler Marshall, produced the first ever wake surf contest- Land Locked Surf Fest- at Texas Mastercraft in Fort Worth. Todd Gaughan of Centurion Boats took first place here with the first ever executed 360 in a Texas wake surf contest. Since then these two individuals have continued to push the limits and the progression of the Texas wake surf scene and today there are nearly ten contests around the state including several World Wake Surfing Championship qualifiers and two of the Tige Boats Endless Wave Tour stops. Since 2007 the sport has come a long way thanks to several grassroots events, like Barrel Boss in Austin and the DFW Surf Open in North Texas, that continue to give young athletes a chance to celebrate wake surfing. Still so young and new 2015 is the most promising and culminating time for wake surfers yet with more local and national events than ever before. 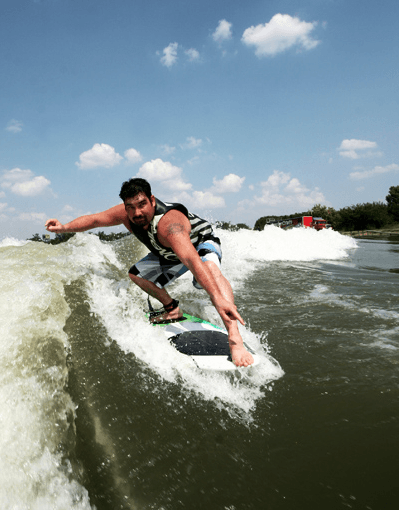 The popularity of wake surfing has completely influenced the inboard boating market including wakeboard focused companies like Supra Boats who have just launched the Pro Wakeboard/Wakesurf Tour and right here in North Texas. February 2015- A Ryan Light Film Featuring Ashley Kidd: Ashley Kidd in top form following her undefeated 2014 season culminating in her first World Championship. Ashley, also a native Texan, teams up with Austin videographer Ryan Light here to produce one of our favorite wake surf athlete films yet. October 2013 DFW Surf’s Big Boat Invitational Presented by Doomswell: A star studded lineup featuring Texans Parker Payne, Zane Montgomery and Tyler Marshall. Parker was voted Best Trick, Chris Wolter biggest air and Tyler and Todd Johnson tied for widest bottom turn. What a year for Chris Kinsey who continues to push the limits today as a Texas wakesurfer, Baylor student, Shredstixx and Tige Boats team rider. Today Wake the Desert is part of the Tige Boats Endless Wave Tour and still the longest running wake event in Texas. 2008: Texas State Championships: Produced by Austin Surf Company and Scott Graham. One of the first wake surfing videos and today it is also the top 5 most watched. Check out the Top 5 Most Watched Wake Surfing Videos of All Time. Lake Austin, TX 2008: One of the first professional wake surf videos ever produced on Lake Austin by Scott Graham featuring Chase Hazen, Wes Beck, Johhny Stieg and Jack Oman.